Many have claimed that rock is dead, and if recent trends are anything to go by, they may be right. As the Black Keys’ screed against Nickelback last January showed, rock is struggling to reconnect with a generation that has turned to auto-tuned, plastic pop stars for entertainment instead of the thrum of electric guitars. But the main reason why people have turned away from rock has gone unsaid. Rock was always about rebellion, but lost people when the image of rebellion overtook the message. Like rock, motorcycles are a symbol of rebellion in culture gone soft. Also, like rock, they are struggling to reinvent themselves for a new generation after marketing rebellion instead of living it. 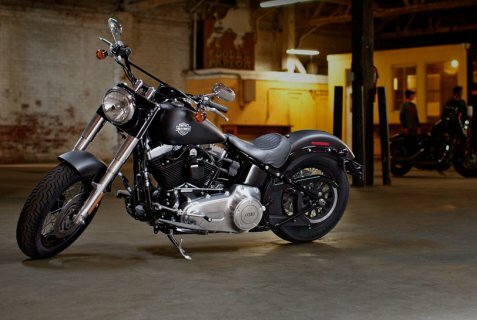 However, as Harley-Davidson’s Softail Slim shows, rebellion is not dead in the motorcycle marketplace. And if this bike is anything to go by for both rock and motorcycles, the way to reconnect with younger kids may be going back to what made you so popular in the first place. The Softail Slim is one of two new Dark Custom motorcycles that harkens back to the days of the choppers and bobbers from the 1950s. In the ‘50s, choppers weren’t just something you could buy; they were built with bare hands and bad attitudes as a serious style statement. To bring the Slim in line with this attitude, the bike is finished with a few time-appropriate design cues. But it’s not enough to just make the bike look old and then market it as something badass; the product should actually act out the marketing message. What Harley has done to the Slim to capture that old chopper mindset is to follow up its vintage look with a really raw riding experience. This first step in bringing the bike in line with its historical inspirations is to get the look right. First, the overall stance is slimmed down to give the bike a more custom look. The fenders are bobbed, turn signals and accessories are slimmed down or removed, a thin solo seat is placed on the bike, and skinnier tires with thick sidewalls are added. Then, a few period correct cues are put on, like the Hollywood handlebars on the bike. Characterized by the crossbeam on the top, and the gentle sweep to bring the bars closer to your hands, the Hollywood bars were originally a Harley-Davidson accessory back in the ‘50s that have been taken out of retirement to give this bike a more vintage feel. However, like the lead guitar in a band, the center of attention on a Harley has always been the engine. In the Slim, the motor is a 103 cubic inch V-Twin that has had an extra dose of attitude added with a healthy coat of black paint. To highlight the vintage feel, a round air cleaner has been added. Internally, nothing is changed over other Softail models. What this means is that you get the same 79hp and 90lb feet of torque that is on other Softails, such as the Blackline we reviewed last year. But more importantly, this is where that vintage feel starts to shine through. The motor responds to inputs nicely, but along the way it vibrates, shimmies and shakes. It feels natural where other motors feel too refined and clinical. It’s more time machine than engine in that it really brings you back to how older bikes feel. So, how does a bike styled to look like it’s from the ‘50s ride in 2012? Vintage feel is a theme that keeps coming up. The motor is strong and torquey like in the Blackline, but does not like to be rushed. Even when pulling the bikes 700lbs of American Iron around, though, power is adequate. Front-end effort is high, and the suspension has very little travel, but looks do come with sacrifice. Braking feel and performance can also be described as decent. Braking response may be difficult to get used to at first, but you quickly learn how much force to apply to get the bike slowed down quickly. Also, the bike has ABS as an option which is highly recommended for new riders. Around town, the weight and feel of the controls seem to bog you down, but out on the highway, it all comes together to form a cohesive, enjoyable package. Just point the bike forward and let the weight and torque take care of the rest as you easily plod along to your destination. The bike is unencumbered by long distances, road imperfections, and other small obstacles that make some other bikes feel jittery while traveling on the highway. The bike is a real confidence booster on longer trips. But Harleys have never been only about the performance; they are about feeling, emotion and attitude, and that’s what shines on this bike and all of the Dark Custom bikes. And their efforts are paying off. CMO Mark Hans Richer pointed out on this trip that Harley-Davidson has the largest amount of younger buyers in the 18-35 demographic. Where the news is dominated by stories saying younger kids only like iPhones and Facebook, Harley has succeeded where others have failed in bringing new, younger riders into the fold. This trend points to a larger theme that younger people want emotional connectivity – not just what is faster, better and newer. A Harley is not an objectively fast bike, but what it offers is an experience past the spec sheet. The way the motor reacts to your inputs, the heft of the bike, and the way it looks all combine to create a very analog experience where most new bikes have you feeling cold. In a world where one of the largest selling apps is one that makes digital pictures look old, it makes perfect sense why younger people should want to ride a Dark Custom bike. And if that’s anything to go by, if rock can reconnect with its roots the same way Harley has, then it should be just fine too.